Home » Gold » Gold price is falling – Good time to buy? Gold is believed as safe haven by many investor. Historically gold is giving very good return to investor but since one year gold is losing shine. In year 2013 gold price dropped by 18%. Many gold analyst predicted that gold price will touch to 35000 Rs/- in 2013 but touching that level by gold is still dream. Highest level touch by gold in India is 33000 Rs/-. Gold price will fall further? Is it right time to buy the gold? Answering this question is difficult but let us try to analyze the situation. Gold and silver prices generally rise when sentiments on the economy and the financial markets are bearish or there is uncertainty over future trends. From 2008 to 2012 we have witness scenario of global economic downturn & recession. This is the time where rise in gold price was maximum. You will be surprise to notice that price of 1 ounce gold more than quadrupled in last 10 years. Looking at improvement in current economic conditions it seems that gold price will fall further in coming future. Another important factor which affect gold price is dollar price variation. If value of dollar is more we need to pay more and thus increase in gold price. 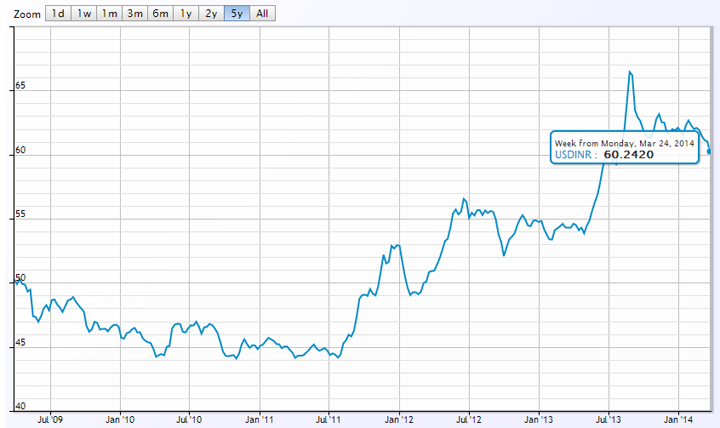 From 2009 we have seen depreciation in INR value compare to USD. Dollar was trading 50 Rs/- in 2009 and now it is trading on 60 Rs/-. This increase in dollar value has contributed lot in increasing gold price. Supply and demand is true for any commodity. 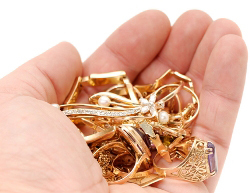 If the demand for gold increases and supply cannot meet this requirement price will increase. Similarly, if production of gold is hit because of a miners’ strike and the supply falls, this will also lead to an increase in prices. Price of gold will fall further? Gold price is falling since past few days and in near future we will not see any major hike in gold price. Currently stock market is observing pre-election really, sensex is on all time high 22000. Analyst believes that stock rally is likely to continue for few months. Due to bullish stock market investor preference has change they and they prefer investing in stock market to earn fast money rather investing in gold. Appreciation in rupee value & import duty is another reason for fall in gold price. If rupee continue to appreciate gold price will further go down. In short as per fundamental analysis we will not see major recovery in gold price in near future. Well we recommend not to buy gold right now.If you have extreme requirement of gold like marriage or some occasion than only purchase it. To choose gold as Investment option right now is not making any sense. Gold price is likely to fall further & it may touch 25000 Rs/- per 10 gm. Good Article Raviraj. However if you observe stock market and gold prices are inversely proportionate. While the reasons specified by you are valid, my feeling is that investors are moving away from gold and investing in stock market. Markets cannot be always moving up, it should get corrected in the 3 to 4 months downline. During such time I feel gold prices should again increase….